Is there anything cooler than watching a low line of LED taillights scream past and fade into the night? Jalopnik readers don't think so. They've picked out the cars that look the absolute coolest in the dark. Which Car Looks Best At Night? Audi calls it a "nighttime signature," and they&apos;re not messing around with them. The car that really got everyone obsessed. 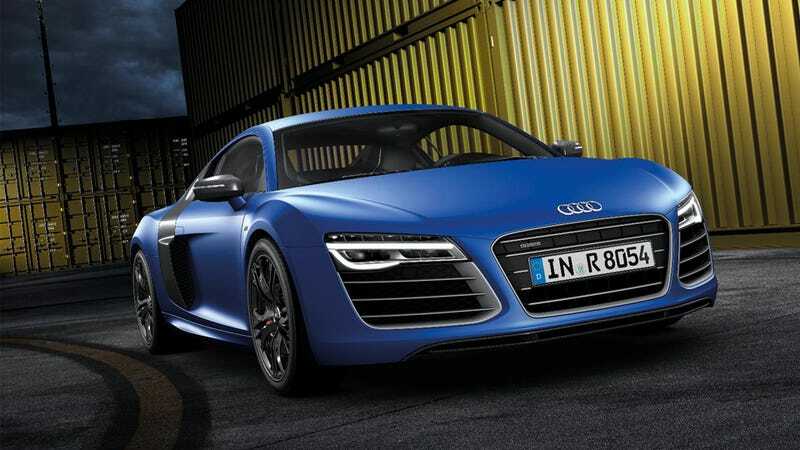 The R8 is the night signature benchmark. Its LED strips front and rear still look awesome at night. Before there were Audi LEDs, there was BMW's ‘Angel Eyes.' Every time you see them pass, you wonder if you just saw an M5. The wide, graceful fan out at the rear is the trademark Aston look. Coupled with their low, sharp headlights, all new A-M cars are great at night. Nothing beats quad rounds at the back. The GT-R does them as well as anyone. Any self-declared car nut can spot a Crown Vic from half a mile away. The exhausts glow with anti-lag (though not on this N/A Porsche). The front ends glow with huge round headlight arrays. Excuse us while we drool. The current-gen Charger wins in the ‘best affordable car' category. They make them into cop cars, too. The best street car of all, though, is the Aventador. The LED three-point stars front and rear are complimented by the occasional burst of flames from the exhaust. Razor-thin LED strips at the rear. Powerful projector beams up front. Glowing brake discs at every corner and flames on the overrun. There is nothing better.